Singapore, 22 August, 2018 – Leading award-winning supply chain and logistics software solutions provider, Y3 Technologies (Y3) and cross-border cloud-tagging specialists, veriTAG, SGX-listed Sakae Holdings’ technology development arm, Sakae Fintech, blockchain infrastructure developer, NULS, next-gen customer loyalty programs provider, Reefic Protocol, and full stack blockchain platform-as-a-service (BPaaS) provider, Morpheus Labs have inked a Memorandum of Understanding (MoU) to launch one of the first International Food Blockchain Alliance (“Foodchain”). -Help companies to develop blockchain technology and concepts and build a multinational cooperation platform for international F&B enterprises to share resources. 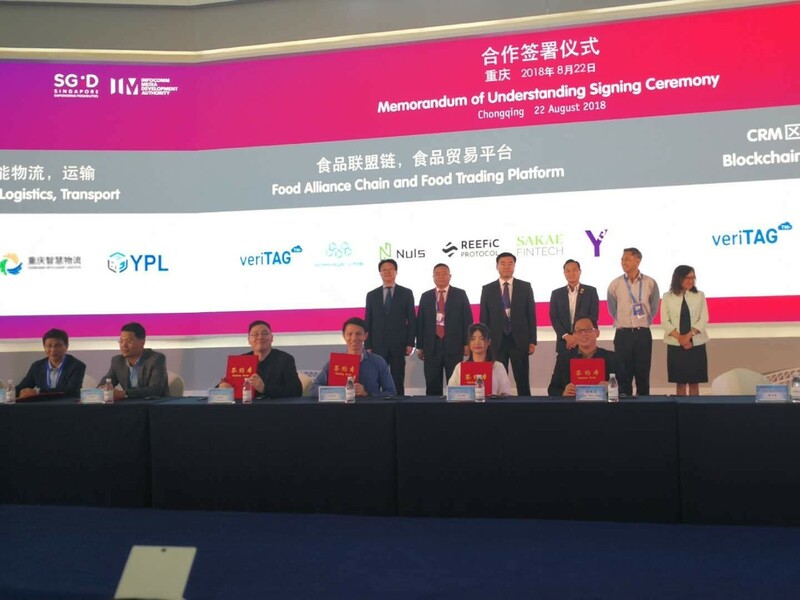 Foodchain expands on the earlier memorandum between Y3 Technologies, veriTAG and Rizon Technologies on 18 April 2018 to build blockchain-enabled cross-border trade platforms. By linking up the food supply chain on a singular platform, Foodchain can offer users an expanded suite of food supply chain solutions to choose from. 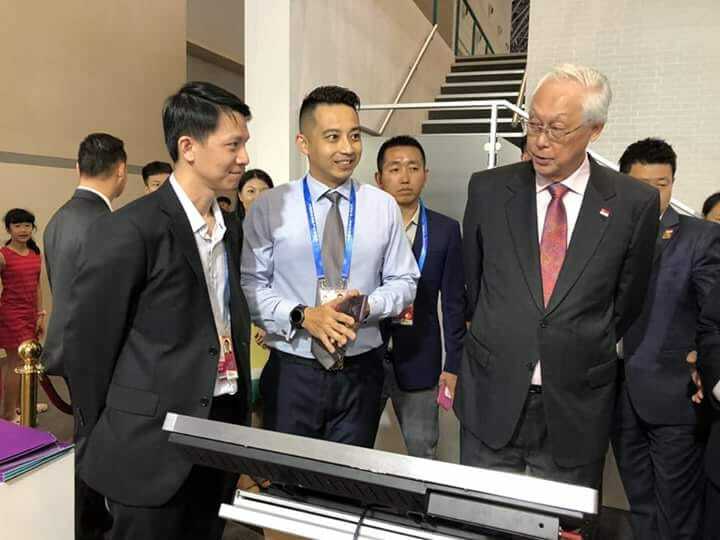 The signing ceremony was held on Wednesday, 22nd August 2018, at the Smart China Expo 2018, witnessed by Mr Li Qian, Deputy Secretary General, Chongqing Municipal Government and Mr Tan Kiat How, Chief Executive Officer, Infocomm Media Development Authority of Singapore (IMDA). veriTAG seeks to create a one-stop solution platform into China for food using its patented authentication system as the foundation, veriHUB, as a central database system with applications and a rules-based engine and veriSHOP to link customers to the products. Currently, veriTAG has more than 40 merchants, 100 unique products on board with strategic partners, which include ito yokado, Isetan, and G Super. Sakae Fintech Pte Ltd, a subsidiary of Sakae Holdings Ltd, is committed to developing mobile solutions and ecosystems for consumers and businesses. Our services: Bitechain – Catering blockchain. Bitechain uses blockchain, Dapps and Bitechain Utilities Network (BUN) ecosystem to support consumers and businesses in the catering industry, providing opportunities for market expansion and integrating F&B data to make informed decisions, promote customer engagement through decentralized marketing, and give companies and individuals the role of tokens in the ecosystem. NULS is a global blockchain open-source project which is a highly customisable modular blockchain infrastructure; it consists of a microkernel and functional modules. NULS provides smart contracts, multi-chain mechanism and cross-chain consensus. It aims to break the technical barriers of blockchain, to reduce the cost of development, and to promote the usage of blockchain technology in the commercial field. Reefic Protocol is is an entrepreneurial company based in Singapore since 2008. The company specialises in the design and development of reliable and high-quality solutions to aid in various businesses and procedures. The company offers its services to those seeking innovation and hybrid designs for interactive entertainment and software technologies. One of the company’s biggest projects, Reefic Protocol, is a decentralised reward exchange for next-gen customer loyalty programs. The platform gives customers the fluidity and security to exchange rewards across multiple loyalty programs that are linked up using blockchain. Morpheus Labs is an enterprise-level blockchain platform that integrates all of the blockchain development tools and resources needed to streamline the development process and modularize it, enabling organizations of any size to quickly design, deploy and operate distributed ledgers. Morpheus Labs’ BPaaS can be used both as a corporate B2B platform and or by a freelance or individual developer to quickly create their own ideas and projects, as well as a B2C model. The platform will support distributed management of blockchain network nodes and off-chain applications, while providing centralized platform services for developing, managing and managing blockchain networks. Morpheus Infrastructure Pass (MITx) is designed to be used for all services and products offered in the Morpheus BPaaS network, platform subscriptions, distribution licenses and token exchanges with other digital currencies or tokens.